Take your shot with the Zuru X-Shot Excel Reflex TK-6 Combo! 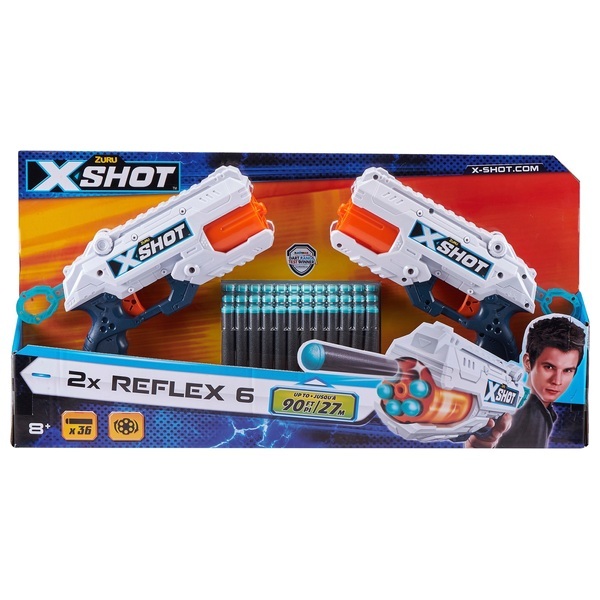 This fast-shooting set comes with 2 Reflex revolvers for double the X-Shot action. Challenge a friend to a target practice or shoot down the included cans with a gun in each hand. The 2 revolvers in the Zuru X-Shot Excel Reflex TK-6 Combo come with 6 target cans and 16 darts. Each Reflex shooter holds 6 darts in a revolving chamber, so you can be ready for your next shot. The Recoil revolvers are perfect for taking on secret missions, preparing for duels at dawn, or patrolling the galaxy on space adventures. The Zuru X-Shot Excel Reflex TK-6 has a range of up to 27 metres, so you can make your shot from over 30 paces. Each Zuru X-Shot Excel Reflex TK-6 revolver boasts a futuristic design in white, blue and orange with X-Shot decals. The blue target cans are marked with target circles to help you fine tune your shot. Make your next shot an X-Shot. The soft foam darts included with the Zuru X-Shot Excel Reflex TK-6 Comboare designed with safety in mind, but should never be aimed at a person’s eyes or face.